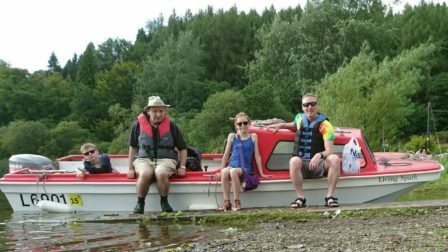 Last week, in what was probably one of the the last of the few good days we’ve had in a rotten summer, we headed out on Crazy Uncle John’s boat for a day on Loch Lomond. For the last couple of years, each time the anniversary of Robert Burns’ birthday rolls around in the last week of January, I’ve been committing to memory the eight verses of his Address to the Haggis to perform the duty on a Burns Evening. On my first attempt at the Rosslea Hall Hotel, back in 2010, I thought my delivery was fairly good considering I’d only learned the poem in the four weeks previous. However, the fact I missed a line out really bugged me and I was determined to do it perfectly the next chance I got. Which is why, when I did the Address to the Haggis at Colgrain Bowling Club in 2011, I was mad with myself for grinding to a halt after just two verses because I thought I’d messed up. After being invited to do it again this year I was determined that I’d nail it, and tried to put the memory of last year’s screw up behind me. If Crazy Uncle John can reel off 14-odd verse epic’s from Burns’ repertoire with only a couple of fluffed lines, then surely I was capable of the flawless delivery of just eight verses?